Moving forward in a dynamic and ever changing ecosystem, the focus on regenerative agriculture management is gaining acknowledgement as having a significant impact on the climate change issues we face in this country and around the world. 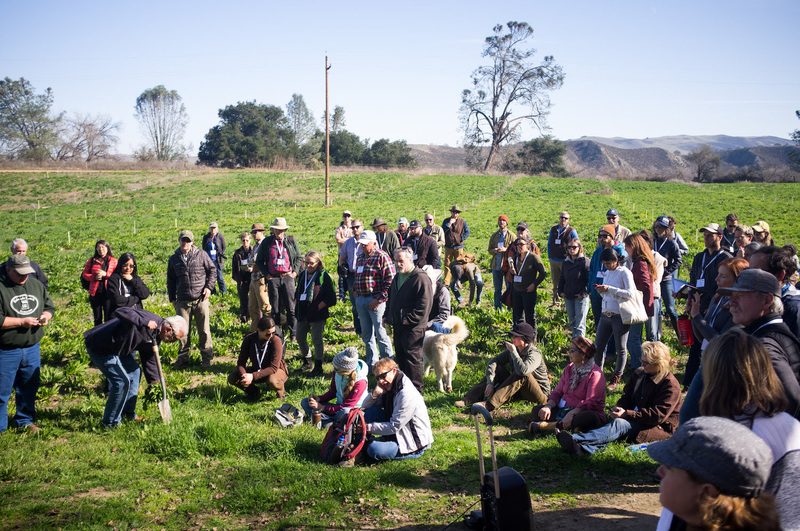 Join us at EcoFarm again this year as we explore regenerative practices in several conference workshops and an exciting, hands-on, all inclusive, gender neutral, Women in Regenerative Ag pre-conference at Paicines Ranch. Paicines Ranch Field Day at EcoFarm 2018. Photo by Ben Kerrick. The answer is, indeed, beneath our feet. In connecting with nature as land stewards of the earth, many farmers and ranchers have been working with whole systems land management practices to build soil, sequester carbon and work towards a brighter, more abundant future. Whether you are a believer in Holistic Management practices, Biodynamics, Permaculture, Agroecology or embrace elements of these methods, we can all agree that something needs to be done and the time for collaboration is now. Two weeks ago I stopped in Chico on the way to the Biodynamic Conference in Portland. With the devastating, destructive fires of 2017 and now in 2018 with Butte County and Malibu, the overwhelming feeling of desperation and hopelessness mobilized a group of farmers and ranchers to stick to their commitment to work together with Gabe Brown and Ray Archuleta at a workshop hosted by the Chico State Regenerative Ag Initiative. I spoke with Cyndi Daley briefly on her decision not to cancel. The answer is clear...do we stagnate in fear or do we come together to work on answers for the future. Regenerative land management practices have transformed deserts into food producing regions. Whether you look at the work of my personal heroes Doniga Markegard, Darren Dougherty or Mark Shepard, Miguel Altierri or Wes Jackson, Nicole Masters, Will Harris, Spencer Smith, John Kempf or Joe Morris...and so many others...we have everything to gain by investing in regenerative practices and the farmers and ranchers, scientists and doctors who are leading that campaign. We look forward to seeing you at EcoFarm and continuing this poignant discussion. Carla's dedication to food systems issues has been the source of her diverse background and interest in working with organizations around the state. She co-founded the Santa Barbara Food Alliance, was a member of the California Food Policy Council and the board of trustees for the Foodbank of Santa Barbara County and program coordinator for the Backyard Bounty program. Carla currently manages the Sebastopol Farmers’ Market and is a consultant for the Sierra Harvest Food and Farm Conference. She is an active member of the EcoFarm Conference Planning Committee and has spearheaded the hands on regenerative ag pre-conference at EcoFarm Conference for the past 3 years. Carla remains dedicated to supporting farmers and to community education and outreach. Thank you for making our scholarship campaign a huge success! EcoFarm Workshop Recordings coming soon!